Cut an opening in the top of the pumpkin. Remove the seeds and pulp, separating the seeds from the pulp; rinse seeds. Discard pulp. Cover a baking sheet with aluminum foil. Place pumpkin seeds on foil and lightly salt. Bake for 15 minutes and set aside to cool. In the meantime, line the inside of the pumpkin with heavy duty aluminum foil. Take cooled seeds and toss together with nuts, raisins and chocolate chips. 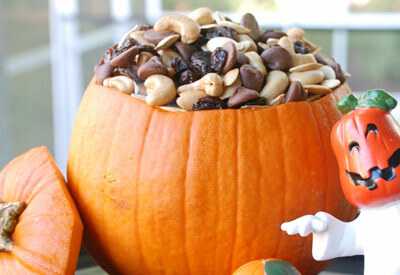 Place mixture inside pumpkin and serve.